NWS map that forecasts potential storm surge flooding from Michael, with deep red meaning there is likely to be over 9 feet of flooding in that area of Florida. Hurricane Michael, now at Category 4 strength, arrived this morning in Florida, sporting 155 mph winds, gusts up to 175 mph, and the promise of far too much water. Flash floods, difficult or nonexistent transportation of all kinds—and likely catastrophic wind damage, are expected. NHC is predicting that Michael will remain a powerful extratropical cyclone over the north Atlantic through at least day 4. 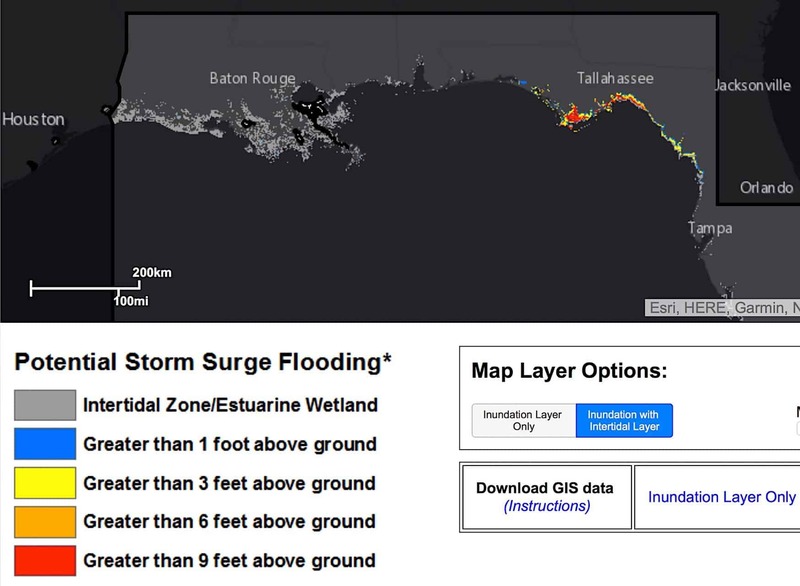 Life-threatening storm surge is occurring along portions of the Florida Panhandle, Big Bend and Nature Coast. The worst storm surge is expected later today, Oct. 10, and tonight between Tyndall Air Force Base and Keaton Beach, where 9-14 feet of inundation is possible. Michael will produce potentially catastrophic wind damage where the core of the hurricane moves onshore later today in the Florida Panhandle, with the highest risk between Apalachicola and Panama City. Life-threatening hurricane-force winds will occur well-inland across portions of the Florida Panhandle, SE Alabama, and SW Georgia, as the core of the hurricane moves inland later today and this evening. Heavy rainfall from Michael could produce life-threatening flash flooding from the Florida Panhandle and Big Bend region, into portions of Georgia, Carolinas and SE Virginia. Tropical storm conditions will affect portions of the SE U.S. coast from NE Florida through North Carolina, and tropical storm warnings are in effect for these areas.